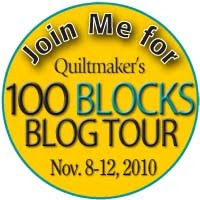 Holly Hill Quilt Designs: 4th Day and More Giveaways! Today's post is going to be very quick. My hubby is waiting upstairs so we can have banana splits together. YUM! Here I am again in 1953. I guess I was all tuckered out from the celebrating. 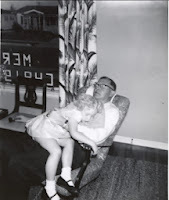 A friend of the family was kind enough to offer to be a comfortable resting place. Now it's 1954. Still tinsel on the tree but look - now we had a color camera! And don't you just love the festive red outfit? And lo and behold - my Mom skipped the perms this year. Mary Jane I'm just login these old pictures. Thanks for sharing your memories with us. Your pictures are bringing back lots of memories. Such fun! 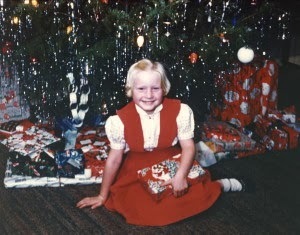 I remember being oh so happy the year my mom skipped the perm. Enjoy that ice cream! What fun! Love the photos ! 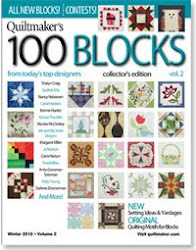 I love the Quiltmaker 100 blocks. I own every one of them and was lucky enough to win one of the mugs. HELLO, yes, Ice Cream is yummy! It is so fun to see the old photos of you, so cute! The part about your mother skipping the perms made me smile. Been there. Banana splits sound yummy, now I want one lol. I wish I had a banana split about right now, lol These pictures are bringing back so many memories. Thank you for sharing them. Hubby and I go out for DQ Blizzards every now and then, I'm not a fan on banana splits.We even get coupons for buy one get one free every so often, so it makes it even more economical! Hope you enjoyed your split! The first picture must be after the big turkey dinner! Still smiling I see. Hope your banana split tasted yummy.